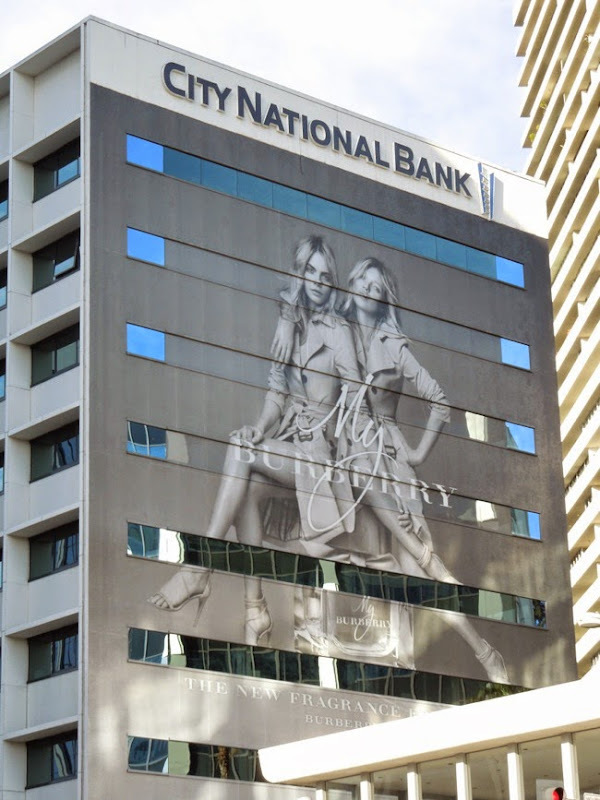 To launch their latest fragrance, My Burberry, the British designer fashion label known for their signature trench coats, employed not just one supermodel, but two, in the form of hot young thing Cara Delevingne and the instantly recognisable seasoned professional, Kate Moss. The two British models, almost twenty years apart in age, were photographed for the black and white ad campaign by by Mario Testino for the fragrance created with perfumer Francis Kurkdjian. 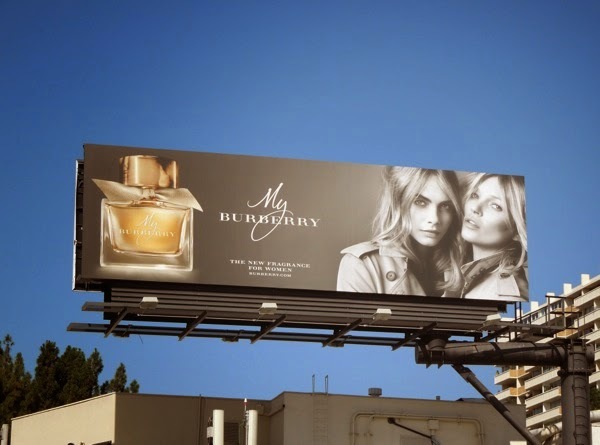 Interestingly 22-year-old Cara Delevingne is also the 'face' or 'body' of Tom Ford's new Black Orchid fragrance billboard, although you'd think there'd be some non-competitive brand clause in the model's contract, or maybe that doesn't apply so much in fashion. 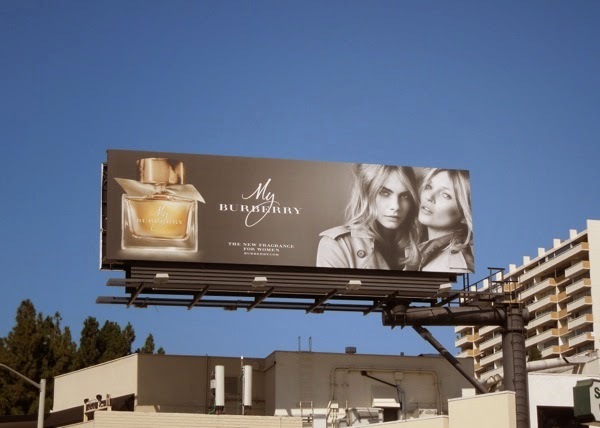 Launched well in advance of the forthcoming gift-giving season, the standard landscape billboard for the timeless new perfume was snapped along L.A.'s Sunset Plaza on September 6. 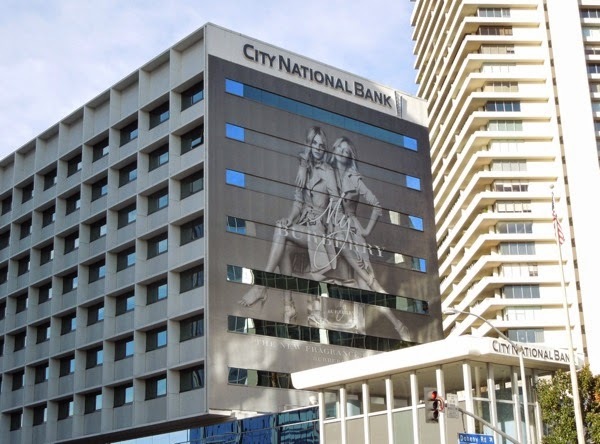 Meanwhile the super-sized 'cheek to cheek' wallscape creative was photographed on October 2, although the full effect was slightly ruined by the sheer amount of major construction currently taking place along the Sunset Strip. 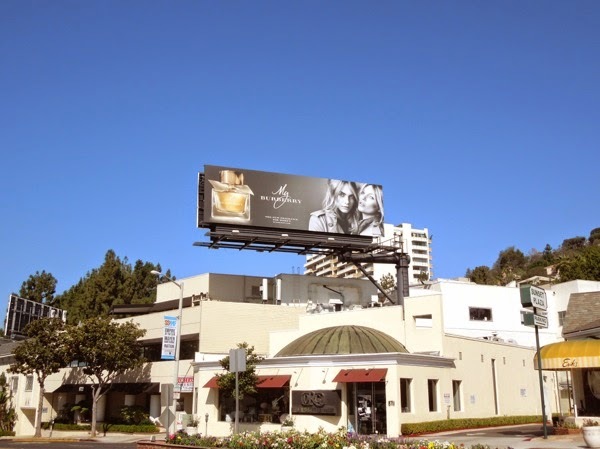 Lately another giant-sized billboard has appeared along Sunset Boulevard, near the border of West Hollywood and Beverly Hills, this one with the ladies sitting atop a giant bottle of the perfume was spied on November 23, 2014. If you're a fan of the fashion house, be sure to check out these previous Burberry outdoor ad campaigns. 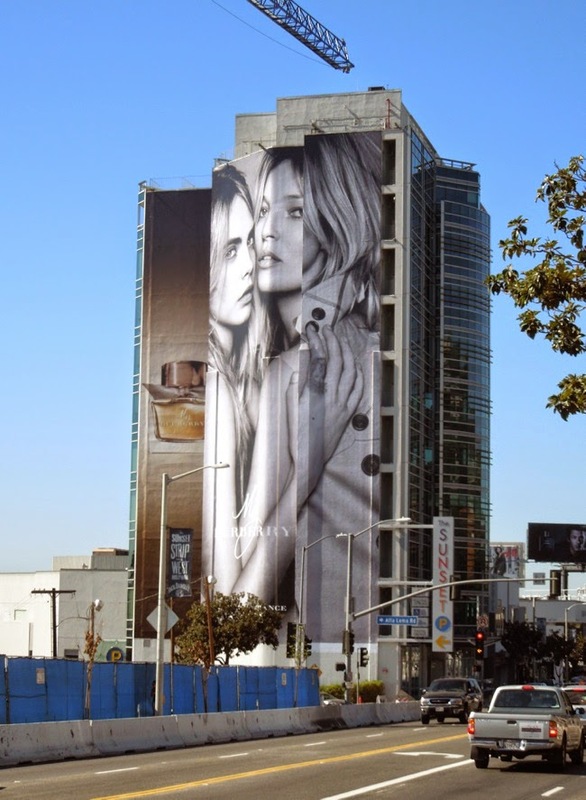 For more designer scents, take a look at these other fragrance billboards from around the skies of L.A. and New York City. 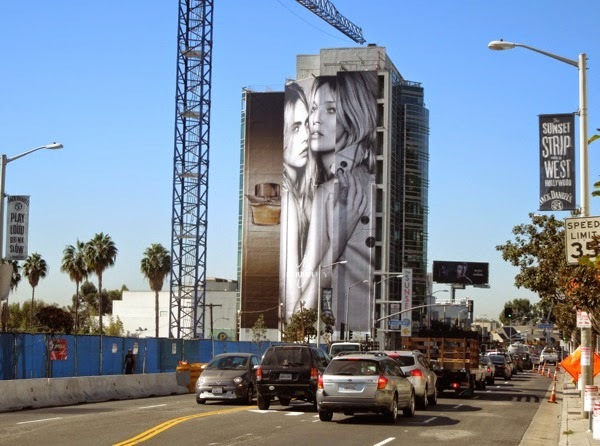 UPDATED: The ladies are back in the skies of L.A. with a new creative for the Eau de Toilette, snapped in the same Sunset Plaza billboard location on August 11, 2015. UPDATED: And here's another updated version spied in the same location on December 24, 2015, just in time for Christmas.